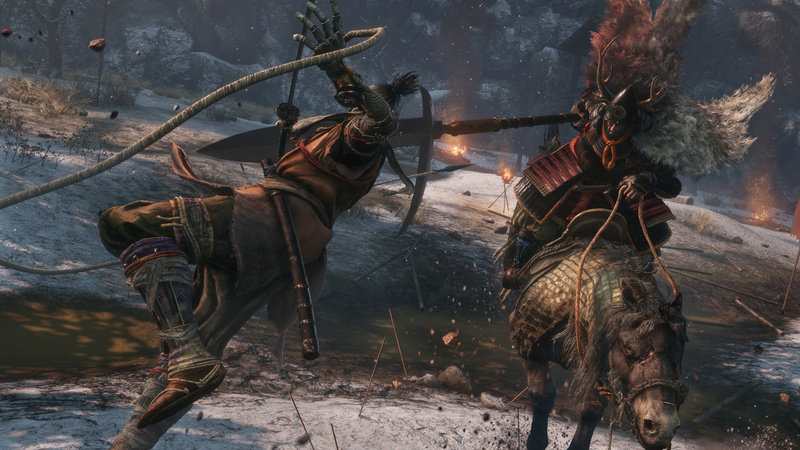 How do you kill Gyoubu the Demon in Sekiro: Shadows Die Twice? Gyoubu Oniwa is quite an iconic boss battle in Sekiro, as he rides around on an armoured horse in an enormous arena in Ashina Outskirts. As you enter the area, he'll make his presence known immediately, riding in and loudly announcing himself. He can be hard to pin down because of his speedy mount, but if you go in prepared, he's not so tough. Before you enter the huge arena littered with dead bodies, you should ensure you have some equipment and skills that will massively increase your chances of winning. Firstly, you'll want to unlock the skill Grappling Hook Attack in the Prosthetic Arts skill tree. It costs just one Skill Point, and is a great tool for this boss fight. Secondly, you should get the Shinobi Fire Cracker Prosthetic Tool. This can be obtained from the Memorial Mob, a merchant who conveniently has set up shop near Gyoubu Oniwa's battleground. It costs 500 sen, which you can grind if needs be from nearby enemies. You'll then need to return to the Sculptor to have him fit the weapon to your arm. Once you have both of these, you can start the fight. Gyoubu Oniwa charges around constantly, running by you and making sweeping swings with his spear. Deflect these and it'll deal decent posture damage. He'll often run away from you to make another charge, and as he turns, you should see a grappling hook prompt appear above him. Grapple to him and attack when you're close to get some damage in. While you're so close to him, use the Shinobi Fire Cracker. This sends out a spread of fireworks that will startle the horse when they go off, giving you a generous window to attack. Gyoubu Oniwa's posture meter fills up pretty quickly, so by deflecting his attacks and utilising the Fire Crackers, you should defeat him rather easily. You'll have to get him with a Shinobi Death Blow twice, but stay alert and keep close to him to take the victory. Once he's down, you'll get the 'Shinobi Execution' confirmation, 1,000 XP, and two items: the Gyoubu Oniwa Memory and the Mechanical Barrel. This is an upgrade for the Shinobi Prosthetic the Sculptor can install, and it unlocks a tree of craftable upgrades for your various Prosthetic Tools. Neat! Sekiro: Shadows Die Twice - Which Skills Should You Get First? 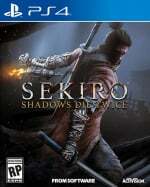 Is Sekiro: Shadows Die Twice Like Dark Souls? I loooooooooved this fight, and I didn't even have the firecracker prosthetic.